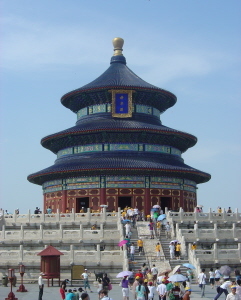 The Temple of Heaven in Beijing is one of the largest park complexes in the city. 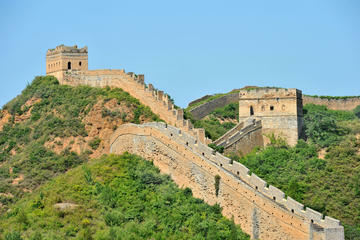 It was completed during the Ming Dynasty. This is where the Emperor would come and pray for a good harvest and worship the heavens. As far as "religious temples" go, this is the largest one in China, but this rather large complex has more of a local hangout feel to it rather than a place of worship, and it is a great place to hang out and people watch. Locals love to come here and practice their Tai Chi moves, you see old folks dancing and on weekends it is more of a family park than a "temple" per se. 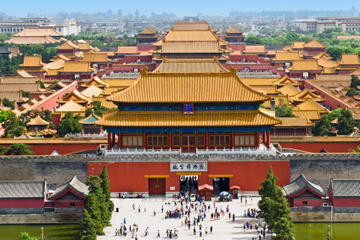 This is a rather large complex with many temples, the main one is the Hall of Prayer for Good Harvest and you can't miss it. The intricate work and the architecture are stunning. There are also many courtyards and lesser temples throughout the complex, many open areas where the kids can run around and fly their kites as well. Blue is the color of Heaven. Red is an Imperial color. This temple is 38 meters high and the wooden pillars support the ceiling without nails or cement. Truly amazing. In the Emperor's time, people believed that the earth was square and the heaven and skies were circular. Based on this, the main building is designed in a circular concept to resemble their idea of heaven. 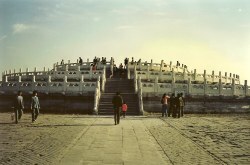 In the South side of the Temple of Heaven Complex is the Circular Mound Altar. 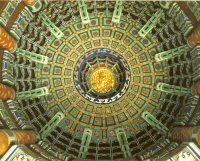 This Round Altar is composed of three terraces of white marble, encircled by two walls, a round inner wall representing heaven, and a square outer wall representing the earth. This Altar used to be the site for the Emperor's sacrifices. This is a good place for kids to fly kites. 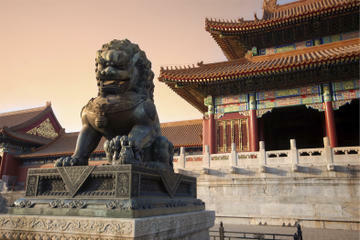 Another good place for kite-flying is Tian'anmen Square which is nearby. Not so far from the Round Altar is the Echo Wall where whispers get carried from one end to the other. This wall surrounds the Imperial Vault of Heaven. This "Whispering Wall" as it is also known, is 65 meters in diameter. For the "voices" to be carried, both people must be facing north and it also helps that the courtyard is not too noisy. 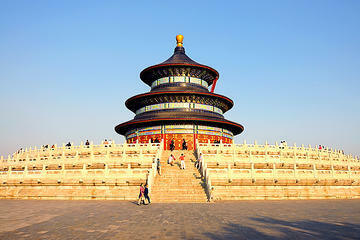 The entire Temple of Heaven complex can be seen in half a day, hope you enjoy it as much as we did! Here's a short video, click on the arrow to watch. 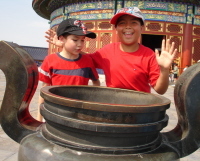 Make sure you include this Temple in your Beijing family travel plans!